As most of you know Carl, one of my business partners and I run a site called Media Buys Coach, located here: Media Buys Coach. Well a while back we starting putting together the ultimate guide to media buying. Kind of like “The Definitive Guide To Adwords” except for Media Buying. When the book was done, we did list it on Clickbank, you can see the sales page for that here: Media Buying Guidebook. We listed it at $77 and felt that was a very cheap price as it contains more information then you’ll get in most courses that charge $2,000. So why am I bothering to make a post on pay per click blog about media buying? Simple, I want you to know that you too can get a $77 ebook for peanuts right now. Go to the Warriorforum.com thread and you can get it at a deep discount. Media Buying works with all kinds of products, services, lead generation and even those email and zip submits everyone loves to promote. When I partnered with Carl on this project I knew a bit about media buying, but I’ve learned so much from Carl that I feel like I can sell anything via media buys. In fact I use it daily on my sites to promote them and still do promote cpa offers via media buys. There is a lot of information out there now about Media Buying, but our Media Buying Guidebook puts it all in one place. We show you everything, from which ad server to use, to how to make banners, to how to split test properly and how to setup buys with networks and directly. We leave nothing to chance for you. I’m very proud of the product we’ve put out. So be sure to check out the Clickbank sales page for details and the warriorforum.com wso thread shown above to buy it. Leave a testimonial in that thread for us and we’ll give you a special bonus too. If you’ve ever been looking to get into media buying but never wanted to spend thousands of dollars on courses, you don’t have to anymore. 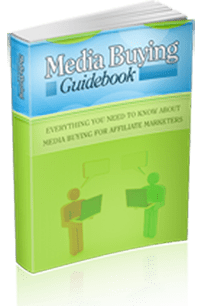 You can know get your hands on the ultimate Media Buying Guidebook right now for dirt cheap.